The America's Cup World Series will now begin in Portsmouth after the opening event in Sardinia was cancelled. Officials say the series will now start on the weekend of 25-26 July. Italian team Luna Rossa withdrew from the race after a majority of teams voted to reduce the size of the boats for the second time in under a year. The other two World Series events are scheduled for Gothenburg, Sweden, between 28-30 August 2015, and Hamilton, Bermuda on 16-18 October. America's Cup organisers plan to change the 62-foot catamarans to 45-footers to cut costs for the teams as the race has struggled to gain sponsorship. 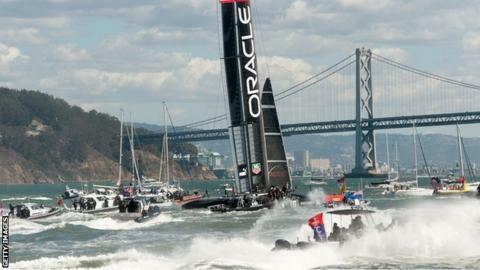 Bermuda will also host the America's Cup signature regatta in 2017. Great Britain's Ben Ainslie is due to take part in the event with his team BAR, who are going to be based in Portsmouth. Ainslie helped Oracle Team USA to win the America's Cup in 2013.